During February, Historic Bear’s Mill is featuring a display highlighting the basketball career of the Clark twins. Current Bear’s Mill owner Terry Clark’s father, Ross, was one of eight twin siblings who played basketball, including an overseas tour with the Harlem Globetrotters. The Clark twins are shown in their basketball uniforms. Ross (second from left) and Millie (far right) are the last survivors among the siblings. 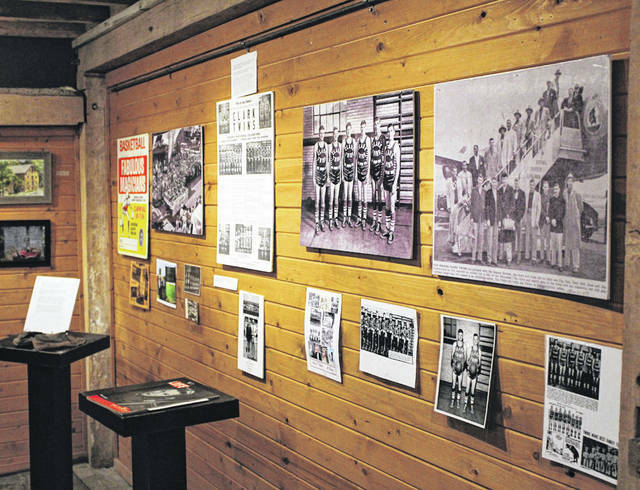 GREENVILLE — A wall display highlighting a local man’s connection to a traveling basketball team that once toured with the Harlem Globetrotters is being featured at Historic Bear’s Mill, just east of Greenville, during the month of February. Ross Clark, 97, the father of Bear’s Mill owner Terry Clark, was part of a notable family from Andrews in Huntington County, Indiana, which featured four sets of twins. Ross and his younger sister Millie, also a twin, are the last of the siblings to survive. Other twins include Bob, Don, Dale, Joe, Jim and Margaret. As well, the family had three, younger non-twin brothers, for 11 siblings total. 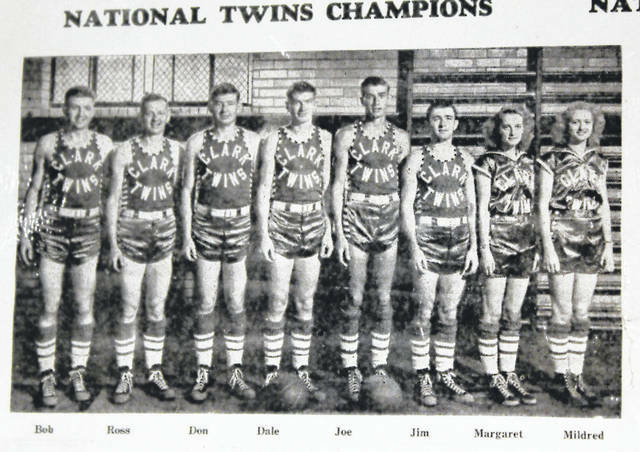 Following the twin brothers’ military service in World War II, the Clarks toured with the Globetrotters for four years, playing exhibition games in foreign countries from 1948 to 1951. The family was featured in LIFE magazine and the “Ripley’s Believe it or Not” comic strip, among other media outlets. The display features various photos and news clippings documenting the Clark twins’ basketball exploits, as well as their unique story. One photo shows the Clarks and the Globetrotters boarding a plane to Europe, while another photo features Ross with famed Olympic gold-medal winner and Ohio State runner Jesse Owens at Berlin’s Olympic Stadium in 1951. Ross has lived in Greenville for the past 30 years and celebrated his 97th birthday Feb.5. “He doesn’t know that I did this,” said Terry, who hopes to surprise him when this article appears in print. The display is free to the public. Historic Bear’s Mill, 6450 Arcanum-Bear’s Mill Road, Greenville, is open Thursday through Saturday, from 11 a.m. to 5 p.m. and on Sundays from 1 to 5 p.m. This entry was tagged Basketball, Bear’s Mill, Greenville, Harlem Globetrotters, Ross Clark, Terry Clark, Twins. Bookmark the permalink.